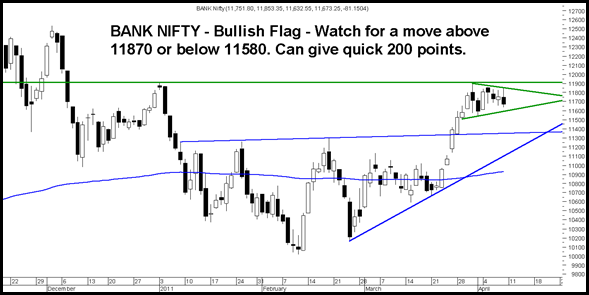 After giving a good breakout at 11100 Bank Nifty gave a good clean move till 11900. Currently it seems a nice bullish flag. Also there is a previous top around 11912. The range for now is nice 200-250 points. Any move sustaining above 11870 or below 11580 can give a 200 point move. 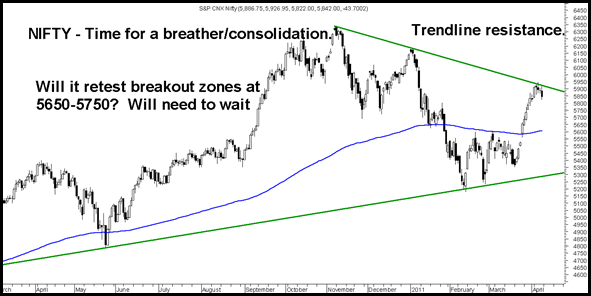 In the previous posts – (Click here for previous post ) had shown the trendline resistance on Sensex and Nifty suggesting overbought zones. Nifty got resisted around the trendline. On candlestick patterns we have seen a reversal signal further confirmatory move below 5810-5800 could open up to 5750-5650 support zones. Its time that index takes a breather and consolidates as the upmove has been sharp. Till it doesnot cross 5920 we may continue to see selling pressure on every intra rise. Index traders may review a long bet around 5650-5700 if it comes. 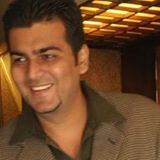 TECHNICAL ANALYSIS TRAINING SESSION PUNE APRIL 23-24.
sir,where do u see the markets by the month end? Nifty 5650-5950 for me seems a range for quite some time now. Time to be stock specific. Ccan you guide me on Rico Auto, got stuck, it showed some movmentum today. Same case with Hinduja Ventures I am sitting on huge loses. Would expect some bounces once the market stabilizes in both of them. Keep stoplosses and review your stocks.